Lazy morning = lazy bento. Luckily, I froze the extra tonkatsu patties I made from the last time we had tonkatsu, so it was just a grab from the freezer then fry affair. Top tier: Rice with veggie furikake. 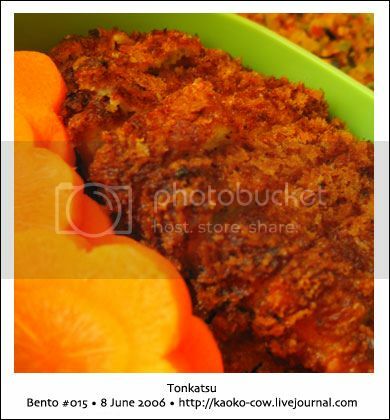 Bottom tier: Tonkatsu with fresh flower-cut carrots. Omake: Tonkatsu sauce in the Hello Kitty sauce container plus a couple of green tea marshmallows, and a piece of lychee jelly. 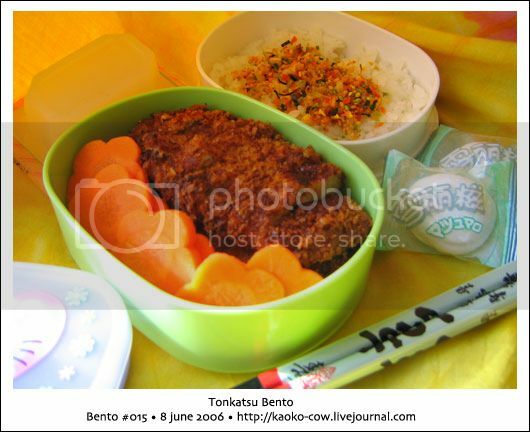 This entry was posted in bento and tagged bento, breaded pork, pork chop, tonkatsu. Bookmark the permalink.